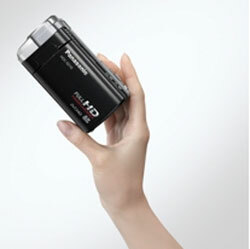 Panasonic Unveils Lightweight HD Camcorders | OhGizmo! The cameras feature 16x optical zoom and use advanced optical image stabilization to minimize shake at high zoom levels. The image stabilization system also works while walking. Both cameras record full 1080p resolution video and can be ready to record in 1.9 seconds. Navigating the settings is done with a touchscreen and a video light and flash are built-in. The SD10 will sell for $549.95 and the TM10 will sell for $599.95 both are launching in September.